Mayor Bill de Blasio vowed to "defend" the "Fearless Girl" statue's right to remain in front of the "Charging Bull." 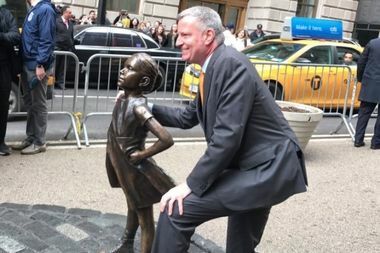 DOWNTOWN — Mayor Bill de Blasio on Friday vowed to defend the "Fearless Girl" statue's right to remain at Bowling Green, after the "Charging Bull" sculptor called on the city to evict her. During his weekly appearance on WNYC's Brian Lehrer Show, de Blasio said the city will make sure the statue — which he called a symbol of the "fight against injustice" — stays in its current location staring down the "Charging Bull." "I think the artist has to recognize times change," de Blasio said of "Charging Bull" creator Arturo Di Modica. "Let's be clear, the 'Charging Bull' is a celebration of unfettered capitalism." The "Fearless Girl" statue was installed in front of the bull in March by one of the world's largest asset managers, State Street Global Advisors to draw attention to the need for more female leaders in business. A petition was started later that month to make the girl a permanent fixture. The city has said it will allow the "Fearless Girl" statue to stay in place through February 2018. On Wednesday, Di Modica, the 76-year-old creator of the "Charging Bull" statue, claimed "Fearless Girl" violates his copyright and turn his work's message "negative." "The message [of the bull] is for freedom in the world, peace, strength, power and love," Di Modica said in a report that appeared in Gothamist. "It's a negative now. The girl is right in front saying, 'Now I'm here, what are you gonna do?'" On Friday's show, de Blasio said the city would be prepared fight Di Modica legally to make sure "Fearless Girl" can stay. "We will defend 'Fearless Girl' and her right to be there," de Blasio said.